People often ask us how we decide to hike where we hike. And the answer is complicated. We have a pretty good idea now about where the main roads and trailheads to the Sierra are, and what's on the far side of that trailhead sign. But we still have so many places to explore! When we first got started, we simply chose a trailhead that led to a popular destination, and followed the trail to that goal. But over the years we've changed that a bit. We now worry less about a final destination, and more about areas to explore. 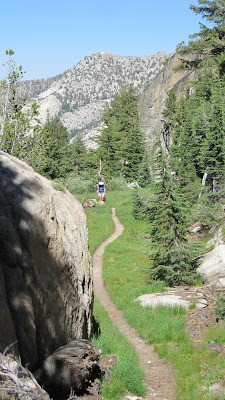 And we worry less about staying on the trail, so that we can wander off into those areas that don't see so many people. So with all that in mind, we still have a long list of places we'd like to hike. There are quite a few dayhikes that are still on our list, waiting for an open day in our schedule when we're in that area of the mountains. And then we have the medium-length trips, and the longer trips that we hope to get to some day. We took two of those this summer, one to Kings Canyon and one to Huckleberry Lake in the Emigrant Wilderness. But while we were doing those hikes, we found ourselves noticing a trail here, a lake there, and a whole other section of the valley over there. Reasons to go back, or to add a new hike to the list.